I found the poland promo CD of "Love sneaking up on you" and did the page on it. I update my DVD list with a lot of new ones. The best is the latest Sting Broken music concert in Warsaw on 2DVD set in perfect quality. Read on stingus : According to Billboard.com, Josh Freese and other artists are already involved in Sting's next studio album, which is supposedly taking place at Il Palagio. Apparently also, this studio album will move away from the overproduced Brand New Day and Sacred Love concepts, and will go back to basics. The Broken Music tour apparently finally enlightened Sting's musical taste, while the rather disappointing sales figures of his latest album further pressed for a musical change. Hence maybe also the reason why guitarist Lyle Workman will also be involved. If you like Bjork and REM I sell some nice items too. I have update the list, with all the 2005 reissues, and some old ones I do not know, mostly from Nick list. Also, I did the MC and LP list. Check MC list in details, all are different... Details list with come... one day ! Sting records a new track for the Chris Botti new album "To love again". Discover this album and the tracks "What Are You Doing The Rest Of Your Life" on the special page I design. I have done a "site map". It will help you to find sections you never seen before. When I design it, I even found things I have forget!! I update Sacred love with all latest issues find since 6 month (thanks to Nick for a lot of images). Well check MC list. So, there is a GREEN VINYL issue of If you love somebody 12" from Mexico... Probably a test or a mistake... And Erwin Kempen get it... Congratulations ! I finaly found the Steve Lipson remix German CDs... and what a suprise when I get it, it has a Swedish promo sticker... So, I made the I was brought details list. I found ones of the most amazing items of my collection : 3 masters of the MFSL Ultradisc issues of Dream of and Nothing like the sun. I miss this one! 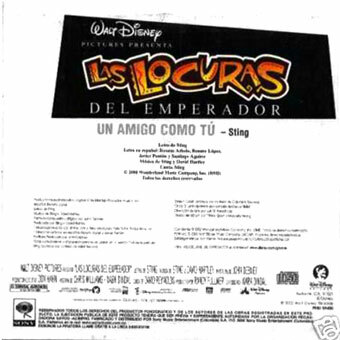 Amazing "Funny friend and me" Phillipines promo CD with the Spanish version only! I get this one! 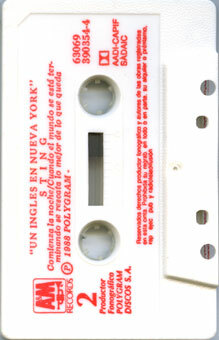 Old Englishman in New York Argentina single cassette! I found bigger scan of the rare "Universal music convention 2004" japanese promo CD. Another japanese reissue of "Sacred love", this one with discount price red/yellow OBI. I have found a promo Polish issue of Let your soul remix CD. It is the german remix issue with a big blue sticker on front. 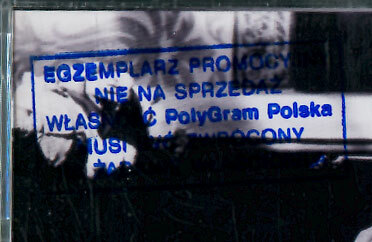 I also find the Sacred love Poland MC with same kind of promo stamp. Every breath French promo 12"
I have start working on it weeks ago, but never found time to end it... tonight I end it ... The soul cages details list. Also, I have put info on the promotional items, even if some scans are missing. Erwin Kempen gets an USA promo edition of the remastered Bring on the night. Discs are CDr. 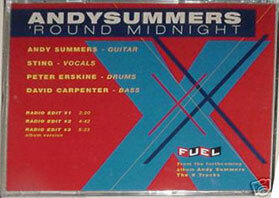 There is a promo CD of "Round midnight", the song Sting records with Andy Summers. It is to promote the Andy Summers best of. It sold out for $84 on ebay!! I finaly move out to my new home! Nick found info on a 2 versions japanese promo CD of "My funny valentine". As www.sting.com announce, Sting's film 'Bring On The Night' makes DVD debut; and the 2CD will be re-released simultaneously; both on March 29, 2005. Daniel Forys found a Switzerland promo CDr of Desert rose. Kenneth Nielsen gets a very nice Desert rose promo CD too, this one is from Finland and it is for the club mix. Title : 'MY FUNNY VALENTINE / MOVIE HITS'. sleeve) Sold out in 1 day, 3 hours, 18 minutes. A get a promo issue of ...All this time DVD. It is the EU DVD but without the printed design, it is blank... and comes in stickered info case with letter. So, I did the ...All this time video list and details. 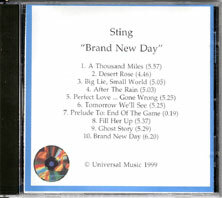 I get Indian issue of Brand new day, it is not a bootleg seeing design of the discs and the IFPI code. I have get one of the latest japanese promo 3" missing in my collection : This cowboy song! But, I have been surprised, it is a stamped promo sign on disc!! - UK tour edition CD+DVD, which comes with 14 tracks as "Like a beautifull smile" is included. Another different Irish promo of Whenever I say your name & Stolen car!! There are 5 differents Irish promo of Stolen car!! I wish all of you and people who love, a wonderfull 2005 new year. I just received a Poland CD issue of "The soul cages". It states "Made in Germany for Sound.Pol for sale in Poland only" on disc and back sleeve. No time for the complete details list of the album, but done the first step to present this issue. I found a strange Desert rose promo CDr from France. seller tells it is a mastering virgin studio CDr... really strange. I find a Swedish promo CD of Brand new day and Fragile. These are UK promo CD with swedish info sticker on back. Check all the album lists for completed list of LP, MC and promotional items. Marc finaly found and Australian issue of Whenever!!! More info soon! He also find a MFSL japanese issue of Dream of with special OBI. Also, Nick find a promo issue of the Fields of gold 2003 japanese reissue. It comes with a promo CDs of Take me to the sunshine too. Nick also find the first Argentina promo CD I ever seen, it is of Sacred love. An Israel promo CD of Send your love (in fact 2nd EU CD with promo sticker) appears. And Daniel find a 2nd Stolen car 2 tracks promo CDr, this one states "2 mixes" on disc. Also, Marc Schäfer found and Indonesia issue, and the CD+DVD reissue is up in Korea. I also update Stolen car list. No new issue, but scans added. Another unusal promo from Japan is an "Universal Music International Convention 2004" which contains 2 tracks, send your love and Roxanne, both recorded live in Japan. I just get the french single MC of "Why should I cry for you ?"... still surprise to find item I did not know 13 years after its release! So on, I did the details list. I just get a very nice US promo VHS with "If I ever lose" video with a picture info sticker on front... I love that kind of item! Daniel Forys send me scan of the strange Broken music german promo CD. It contains Sting biography read by German... readers! Sting.com announce :Videos for three versions of the single will also premier on AOL's 'First View' on April 23 through April 26. The videos are for Sting's radio version of the track, for the version with rap artist Twista and for the Batson-Doc-will.i.am Remix featuring will.i.am of the Black Eyed Peas. In the U.S. a CD multi-single will be released on May 18 which will feature each of the three mixes plus all three videos! Also, Nick see a white label US promo 12"... more ASAP. I finaly found the rare Taiwan first issue of Ten summoner's tales with special OBI. 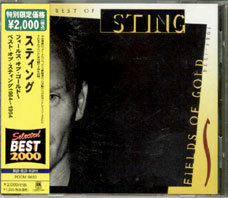 Nick founds another amazing japaense item : the EU remastered Fields of gold CD with OBI!! I also gets the rare DCC issue of this album. The first promo appears on ebay, the EU promo with 3 remixes... It comes with a nice info sheet about the tour. Nick finaly gets the Japanese promo CDr issue of Sacred love... And there is a digipack issue of the album from Korea! EXELLENT NEWS : Sting.com annouces a EU tour edition of "Sacred love" : it will hit stores in Europe on April 26th. 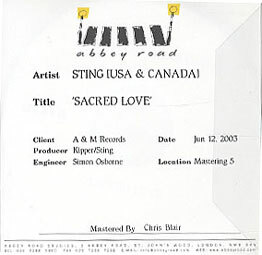 The new version of "Sacred Love" will have the same content as the album released in Europe last year but will feature new cover art, the radio edit (Kipper's mix) of "Stolen Car (Take Me Dancing)" and a DVD of Sting's Much Music performance. / 3. B. Recluse Remix featuring Twista. I just get the rare and unusal Uruguyan promo MC of "Englishman in New York - Ben Liebrand remix"... So on, I did the Englishman'90 details list. I also gets the Korean MC issue of The soul cages which, as the LP and CD issue, comes with a different design... Also, "Jeremiah blues" was excluded! 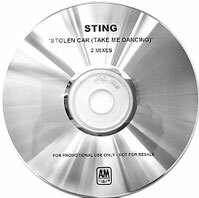 After reading this about "Stolen car" new single on sting.com, I am scared : "Kipper recently commented "I have been busy working on a remix of 'Stolen Car' which is going to be Stings next single. This new version features record breaking rapper Twista and a complete reworking of the groove and chords. I initially did this version with my good friend Keith Beauvais in Bagshot." I also update the promotional items list of Sacred love, with scans of 2 special Taiwanese promo items : a promo VCD and a promo press photo CD! Thanks to Jim for these infos, and to Chris for the other scans. I have had scans, screeshot and details on the very well done exclusive fan club CDROM. A very strange item appears... it is a promo 2 CD set of Sacred love, one with the original album, the second with instrumental versions... More info ASAP. I have done the Fragile, If you love and Mad about you details list. T he good thing is that when the songs are played, it features the varied sounds... difficult to explain with my poor english... you can see sting line, kipper line, Jason line, all the lines of the track... and it also features the lyrics, like for a karaoke!! I have done the ...All this time details list. Nick, the definitve japanese specialist, gets an amazing Send your love promo CDr, with the same design to the promo MC. After the German 3" pock it, it is the Australian issue that has been canceled... Has Sting said on sting.com "I used to know when a single would be a hit, now I don't !" Update the Inside DVD page with info an Taiwan and Japanese promo issues. Lyrics* & Photo Gallery* ( * only playable on DVD Audio/Video players). I have put a new section to present "all the other varied items"... The firsts are the very nice Olympia Sacred love concert invitation, and the Musicares invitation. Nick gets the so rare 1998 japanese reissue with special OBI. He also gets the japanese promo 3" CD... do not know this one exist! Also, it seems there is a promo issue of the japanese 2003 reissue, but I haven't scan of it. Even if I did not find it yet, I got a beter scan of the rare Polish Desert rose promo CD. It seems there is also one of Brand new day, but as I never see it, I wait until a confirmation to list it. I also get a better scan of the EU promo CDr. Tom gets an amazing Sacred love US promo 7 tracks sampler CD. I done the Whenever I say your name details page. Christophe Laversanne send me scan of his very nice Spanish press kit of Sacred love. A 1 track "Send your love - Dave Aude remix" UK CDr appears on ebay... 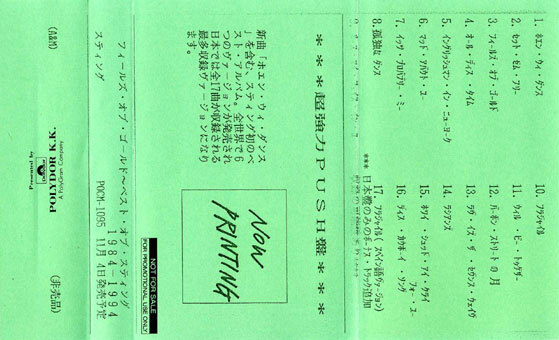 I update the Send your love list with also, scan of the amazing mastering US CDr find by Nick. Also, Sting record a duet with French singer Charles Aznavour for his new album , "L'amour c'est comme un jour" (love is beautifull as a day). It will be issued in 2004. I update Send your love page, with the japanese promo stickered CD found by Nick. I have done the Ten summoner's tales video and Summoner's travels pages. Will.I.am remix featuring The black eyed peas is the name of the remix of the second track on the spanish promo CD of The "Whenever I say your name". I update Sacred love & Inside pages with new scans and details of the promotional items. The "Whenever I say your name" first promo appears. It is a spanish promo CDs in card sleeve, and the second track is Will Iam (remix featuring The black eyed peas)... Have no idea of what it is!! More infos ASAP. A strange "Live at the blue" CD-rom which has the side of a credit card have been made by American Exporess to promo the Sting chow in chicago on October 10th 2003. French promo 1 tracks CDr. I update the visual works page with details on soul vages period videos : Soul concert, Unplugged and Birthday concert LD only issues in Japan. I update the Sacred love page with issues from Malaysia, South Africa, UK... and add scans of the very nice Taiwan issue. 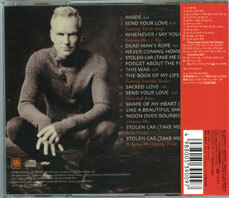 "Inside" has been released today, and it is simply fantastic... the versions are superb... a pure moment of Sting live! My question is why Don't they play the songs like this in Paris??? Thanks to Erwin Kempen, Antoni Carbo & Jorg Zimmermann for the help with the Acetate article. There is a very nice Korean 5 tracks sampler CD of Sacred love, with the same sleeve as the Send your love single and DO-0899 catalogue number . So I update the Sacred love details page. Also, the album was released today in the USA and in Europe as a normal issue (not limited SACD in digipack). Daniel Forys gets a "Promotional Snippet CD-R, made for the german Saturn stores, may that´s a fake!" Darren Gray brings this amazing info when we met up in Paris : the version of "Never coming home" of the SACD, when it is played on an SACD player, runs around 4 minutes longer than the version played on a normal player!!!! Nick brings me this info : apparently "All this time" will be re-released in Japan. The date is november 21st and the number will be UICY2424. "At The Movies" has been re-released last week, 3 weeks earlier than expected with the number UICZ-1095. As you know, Sacred love has been released today. The french issue is an EU SACD in digpack, with 12 tracks and a sticker in french. Also, the Taiwan issue comes with a special slip case and a nice 40 pages booklet. Back in 1985! A friend of me have a friend who have the amazing 85' promotional CDV of if you love somebody. Issued in Germany, this test CDv comes with a special colour sleeve and states 3 tracks : If you love & Love is the seventh as audio, and the video of if you love... But, the disc plays no track at all!! 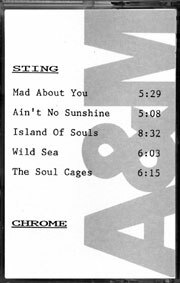 I only have a bad black & white photocopy of the sleeve, but it is more than I never have... probably the rarest Sting CD ever! Daniel Forys has found an amazing promo set of Sacred love. Made in EU, it contains a sampler CD with 7 snippets from the album, and a promo DVD, all in an amazing DVD package! Superb ! I have update all album list with info and scans of Japanese reissues with black OBI... special thanks to Nick for these. There is an UK promo 12" with 2 versions of Send your love. Kenneth Nielsen get a German remix promo CD which contains 6 remixes with special titles sleeve. Greg Bratton, find a a Sacred love "white label promo copy, with 3 bonus tracks, promo video, OBI and lyrics". Cat. No. UICA-1015."... more info soon. Order Send your love CDs and DVD singles at special low prices!! - making of "Stolen Car" and "All Would Envy"
More info on the inside DVD, here comes the tracks listing : New live performances recorded and filmed in Malibu and LA. · Bonus performance: Every Breath You Take. · New interviews and rehearsal footage. Check Send your love >>. There is a japanese promo Send your love MC, this is the time of unusal items!! All the Sting album have been reissued in Japan with special black OBI... infos and scan of all will follow, all comming from Nick. Kenneth Nielsen has found an amazing CDr with special demo/unreleased version of "Perfect love gone wrong" with the rap singer Eve. Also, a Send your love DVD single is annouced to be released in Italy on September 5th, and in Australia too on 8th.... more details will follow. Send your love 2x12" promo with black sticker is "Made in EU". The members area of sting.com is online, and it is simply amazing ! You can watch an amazing "Dead men's rope" rehersals video, and I love this one too! Also, sting.com offer the possibility to order tickets to the special concert in Paris on 22th of september. I will be there, who will? A special remix CDr appears with 4 different mixes. 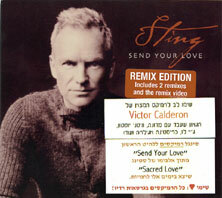 Sting.com also announce the desepointing track list of Send your love singles... hope you like Dance! - There is definitly a UK 1 track promo CD with sleeve, the catalogue number is SEND1. So the 2 track promo CD is probably for EU promotion. - Antoni Carbo send me scan of Send your love Universal 2 tracks promo CDr without sleeve! - Antoni Carbo find the Sacred love press kit, it comes in a white folder with pink sticker, with interview and other details on the album, and with 2 promo CD : one is the 2 track spanish promo CD with sleeve, the other is a Send your love Universal 2 tracks promo CDr without sleeve! 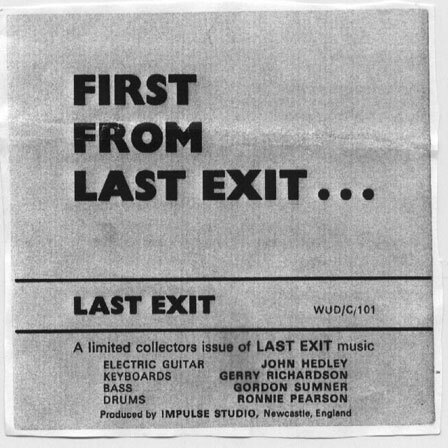 - Greg Bratton find an UK 1 track promo CD with sleeve, more details when he has it. - also, Greg reports : Chaos Music in Australia has Sacred Love available for pre-order in both a standard CD and an SACD. They also have a Send Your Love CD single and a SYL DVD single available for pre-order. Sting us report there is a new remix of Send your love by John Wink who said : "This mix was a great challenge, as I found myself torn between doing something that could be a big commercial rossover and staying true to my underground nature. So I did a full vocal version in a deep loungy house vibe and then a more left minimal tech house version." Nick Guthier report that the new album Sacred love would be releases on SACD HYBRID DISC in Japan on September 30th , l along with the regular CD album. The number of the regular album will be UICA-1015 and of the SACD it will be UIGA-7001. Nick Guthier also report that "At the movies" compilation CD firsly issued in 1998, will be released on September 21st with the number UICZ-1095. Let's see if the tracks will be any different. I also add LP scans and some update to the Bring on list. Check Send your love list >> & follow the details buttons. - update all the vinyl singles list from Ten sum to ...All this time, most of the releases are listed and scanned, with the amazing help of Ruediger Hoeckel (thanks you so much). - done Bring on the night singles lists that werre missing. - done Nada como el sol singles lists that werre missing. Nick Guthier send me scan of the 2 tracks promo CD from Spain! 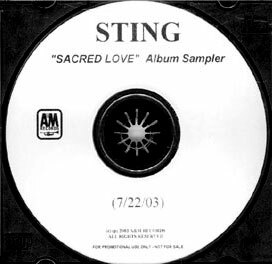 Stingus report Sacred love would be released as a Surround Sound Hybrid SACD on November 23, 2003. Also check Stingus for a very interesting "STING COMMENTS ON NEW CD". Carlos Raffols has found 2 tracks promo CD of from Spain! Again, the tracks are: Radio Edit & Dave Aude Remix Edit, an it comes in card sleeve. Greg Braton has found 2 tracks special promo CD of from Poland!! The only details he has so far are that is in a picture cardsleeve and the disc is marked "Universal Music Polska" on the back. The tracks are: Radio Edit & Dave Aude Remix Edit. A 2 tracks special promo CD of "Send your love" have been issued in Mexico, with edited version and Dave Audé remix. It comes in card sleeve. A 2 tracks special promo CD of "Send your love" have beenissued in Japan, with edited version and the Cornelius mix of "Moon over bourbon street". This is due to chart reason (every Italian release is released on Friday). Ebay auctions for "Send your love "promo CD have been canceled by ebay!!! The catalogue number of the japanese single would be UICY5006. - My funny friend and me as I have added the Hong Kong issue find by Nick. I am more than happy to have ended all the singles and album list now. Except some update missing, all the CD lists are online! I am now ready for the new releases!! - the "new acoustic version" of Shape of my heart, probably the one from Dominic Miller latest album. - Englishman'90 as I have at last find the 4 different German disc issues. Fragile list is up, as If you love & Mad about you. Nick Guthier find a very strange Soul cages issue! It is the Italian release that includes "Muoio per te", but it is a japanese release with OBI! Really strange. Greg Bratton get the original japanese issue of The dream of the blue turtles with OBI. the single will only be on September 8th. The CD-single promo of "Send Your Love" are already available. The latter contains besides the radio edit (3.38) also the remix edit by Dave Audé (3.16). This will be accompanied with the release of 12" club remixes in July (probably by Victor Calderone). - the international release date is September 22nd but it would be September 10th in Japan. - The first format will be "Sacred Love" as a standard album, while a "Sacred Love" limited edition in a special package will follow. - Sting's official Web site will soon begin posting a wealth of "making of" footage, outtakes and behind-the-scenes photos, as well as a preview of the DVD and early snippets of "Send Your Love". - February 2004: 3rd single release. After the rain has fallen list is up. I was brought to my senses list is up. While I was working on this list, I ask help of Sean I.M Potter, and he has an issue I never heard about : A German Steve Lispon Jewel case commercial CDs, which as the same track list as UK digipack! Also, there is 2 UK Digipack issues, only the discs are differents : one mastered by PDO has a 5" playing side, the other mastered by Mayking has a 3" playing side. Also, the disc center are different! Greg Bratton send me this : I received an e-mail from HMV in Japan today announcing the release of Send Your Love in Japan on 7/30. Check this link: It appears a 2003 version of Moon Over Bourbon Street will be on the cds also. - "Sacred Love" will be released internationally on 22nd September 2003 and on the 23rd in the USA, accompanied by a limited edition package. - Sting.com mentions July release date because "Send Your Love" will first be released internationally for radio and video at the end of June. - the A&E channel will be broadcasting a special film on the making of the album in early October. The "Send Your Love" release date is July on sting.com, as the same time of the site relauch... hope it would be as good as we can expecte it! - The 1st single, "Send your love" is a sophisticated electro dance song! 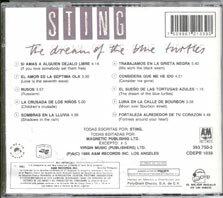 - There is duet with Mary J. Blidge, called "Whenever I Say Your Name"
- The "Kipper touch" is really present again and religion and romantic love are the main themes of the album..
Also, Sting told them about his biography, that he is writting and should be released in 2004. Sting will talk about his life until 25 years old, before being famous! Thanks a lot to the french fan club for all these infos. If you are french check ther full new site and suscribe to the newsletter for all the informations in french!! Sting's new studio album will be entitled "Sacred Love" and will be released internationally on 22nd September 2003, and features 12 tracks. The first single "Send Your Love" will be released on the 8th of September 2003. A full length DVD will be released in September/October as well (source: Universal). Victor Calderone made already a remix of "Send your love". Check Stingus for more infos about the DVD and so much more! After winning The let your soul Acetate CDr on ebay, from Nick, a guy contact Erwin Kempen, that I outbid, to tell he is the seller. He tells him I do not want it anymore and so on can offer it to him. I contact this guy telling I was the winner and ask why he lie like this and he never answers. So, do not buy any item from this guy!!!!!!!!!!!!!!!! Erwin Kempen have this amazing mastering CDr in his collection. It states "Coca Cola Level 1 radio concerts" and, added of tracks by Lemonhead & Living colours, features All this time/Mad about you/Ain't no sunshine/Fragile/Message in a bottle all recoreded at Wallsend 21.04.91 acoustic concert, the same as "Acoustic live in Newcastle". If Mad about you and Ain't no sunshine are on the box set CD, the 3 other tracks have never been available anywhere else with professional sound recording! Nick has find a second 1993 reissue of dream of with different back OBI. Added of the second 1993 japanese reissue CD found by Nick, I just get the Australian MC which comes with a special colours sleeve. Added of the second 1993 japanese reissue, Nick also find the USA reissue CD and the so nice Korea promo CD. I have received the Colombia issue. Nick has also update his collection list with scan of all the Dream of LP he has... amazing! During an email discussion with Craig Betts, one of the biggest police collector's (check his site The police file), we talk about some of the rarest Police items. My friend Alain Berthault from France, have most of them and send me photocopies of them, as of the old 80's police collectors magazines in which there were articles about these items. - Reggatta - FR test pressing 10"
- Reggatta - test colour blocks 10"
"This cowboy song" single list is ready. I have add scans of the Fields of Gold best of LP, and did When we dance single page. I have added details and scans of "Vengo del sur" & "Muoio per te". Check also his site truth-hits-everybody recently updated . The Why should I cry for you ? single list is ready. The Soul cages single list is ready. The Mad about you single list is ready. The all this time single list is ready. As you, see I change of host, and out of print is now at www.stingoop.com! My new email adress is fb@stingoop.com, and the outofprint@wanadoo.fr won't be used after end of april. Instead of taking time on the details on each issues of the albums, I will focus on the single list. I start the singles lists... also, I want to end up all the list before next album! What a challenge! I have update and redesign the All this time page... all the album list are ready now... take a break before next step... the details! I have deceided to sell the 3 issues I have from Brand new day that do not fit in my collection as I really think there are not official. Check my ebay page for infos. Thanks to Nick and Tom for the help and inspiration for the re-organisation. I have started to improve the site... The first step is the navigation... it seems simple but it takes me 3 days! A ll the lists have been updated with rarity rates... but due to the changes, all the details pages are not available for a moment... sorry! First of all, I wish all of you a wonderfull 2003. Thanks for visiting out of print so often, the bring me the envy to continue it. To late to do big updates tonight. Greg has found amazing Israel issues of Ten summoner's tales, and Marc Schäfer brings some nice Argentinean and Chile CD from his holidays. Check his 2003 Sting list at filmundmusik for details. More updates soon! To well end the year, I finaly made the list of Fields of gold & Demolition man issues. No details and pictures, but all the album lists are ready by now. If you have an item not listed, please write me. Ialso update "...All this time" list with scans and infos of is a special limited edition Brazil reissue. I need your help to complete this section, if you have MC that can fit in the article, please send me scans. I also have found a French single MC of Fields of gold, with a very different design to other countries issues. Who collect MC? If you do, please send me the list of MC you have, I am not as complete as for the CD about that. I laso update the links list. At last, a big site update! First important thing : I have drop down the prices of most of the items of my sell list... only for a month! check it and order 3 items for free post costs! - Brand new day (German interview CDr and Thailand issues! thanks Greg for your amazing help! Also, Erwin found a Brand new day promotional German Motor/A&M interview CD. I also put the profile of Nicholas Guthier. All this time : another US CDr promo & Danemark promo CDr. I have, at last, update my audio list. I just have received an amazing concert recorded in 1990 in Uruguay with a perfect soundboard recording, with simply incredible version of My Funny Valentine, I burn for you medley with Mariposa libre... amazing! Check the to find the latest things added. Check directly here for details on this concert. I also put the profile of Greg Bratton. You can also check my udpated wants list and collection list. I am back from my amazing trip in Vietnam! > I also got my reissued version of Fields of gold from Japan with a different OBI. And again, a good surprise! 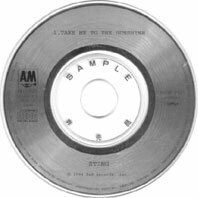 It comes with a 3" CD of "Take me to the sunshine", but a reissued version with a different catalogue number (UIDX-1002) and some differences on the back sleeve writing and on disc. Lyrics insert and chronological insert which comes with the CD also have the catalogue number of the disc, UICY 2551. > The Unplugged video has been released on DVD in Brazil. Some copies werre sold with a magazine... Check ebay to get your copy. Details : Dolby Digital 5.1, photo gallery, discography, english and portuguese subtitles (removable), NTSC, code region 1-6, works worldwide. A lot of new items for sell, check my sell list. Post free for any order received before 12 Jully. I have put Nada como el sol list, added of Nothing like the sun singles & Nada como el sol single lists... Check them. I udpate my sell list with a lot of rare stuffs as Mad about you US promo and rare bootleg LP... check the list. > Jim Chang send me scans of an amazing Brand new day promo diary... But this one doesn't come with a CD... check scans in the latest items page. IMPORTANT NOTICE : As I am fed up with span emails, I will not use my sum.col@wanadoo.fr email after July 15th. So, from now, only use my outofprint@wanadoo.fr email adress and delete sum.col one. Thanks. New dominic Miller album will be issue on July 1st... check www.dominic-miller.com for details. Show will take place at The Majestic . 1 Place Voltaire . 42700 Firminy at 8h30 PM . Ticket will be 20€. Reservations can be made through the tourist information in St. Etienne. The number is (00 33) 477 373014. > Nothing like Sting : the very interesting collector's Nicholas Guthier site from Japan with scans and info. Check ...All this time list for bigger scan & details. > Greg Bratton has found this Universal Fragile CDr on ebay for $45... Check Fragile list for bigger scan. I have change this home page with a direct acces to the varied sections... hope it will be better like this. Greg Bratton have found a new fragile promotional CDr, and a new All this time sampler CDr have been located... more info soon. Nicholas Guthier has find an amazing ...All this time japanese promotional universal CDR. > I have received a second Poland promotional CD of After the rain has fallen. This one contains the album version and has a different design... Check After the rain list for bigger scan & details. Check The soul cages list for bigger scan & details. .edit the list of set them free single. .add scans of the very rare set them free remix mastering CD at the article. .add scans of DJ86 promo 12" to the rarest items section. .add scans about rare all this time & fragile items to the rarest items section. .udpate Nothing & dream of lists. Darren Gray send me scans of the UK Very best of sampler... check it. I have put scans of the US first promo CD of Until... check latest items section for infos. (Thanks Greg). I have update Fragile list with some infos and scans of the amazing promo Brazilian CD I received. I have update ...All this time list with a new US promo CDr which contains international tracks list... scan will follow. 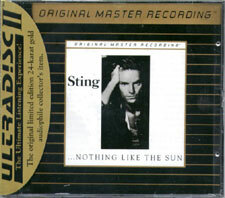 All Sting albums have now been issued in Russia official, by Universal. They come with some differences, the principal one is that the booklets are thinner, most of the time only 4 pages without lyrics. Greg Bratton is waitting for remastered CD from Mexico, more will follow. I have put scans and info on the promo DVD audio of brand new day. Greg Bratton and I have found a surprising but official Brand new day DVD audio... it also features a photo gallery, Music markers, lyrics, artist bio, & a 26 minutes "A brand new day" documentary... that I haven't watch yet... The disc is a very nice picture disc... It is from USA & have the DVDA0004 catalogue number... more scans will follow. 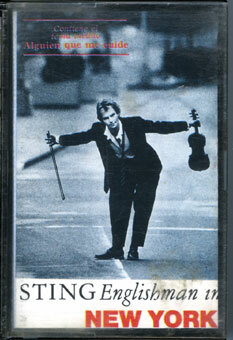 As you probably know, the very best of Sting/Police will be reissued the 18th of February 2002. The songs Let Your Soul Be Your Pilot, Russians and Roxanne 97 that appeared on the 1997 edition are now replaced by Brand New Day, Desert Rose and So Lonely... And the sleeve is soooooo beautifull! Hours of work to do such a good graphic job! I update my collection list with the list of promotional items. Important message : next week, I start a new job in a new town. I will move out to a new appartment on 11.02, until then I won't have access to this computer and could not answer to email. Until then, visit all the new pages I have update and check www.stingus.net often! I have write a new article about Mastering CDr issued in 1995 & 1996. Greg Batton send me scans of 2 new items he finds : a promotional fragile/all this time tuscany olive oil bootle, and a promotional sampler CD of Cinema Italiano. If you have not suscribe to the mailing list, you are missing a special gift only send by email... suscribe now!
. Scan of an amazing After the rain remix POLAND promo CD I received. Sting will start the preparation for a new studio album in April. The recordings will be done at his Tuscany estate and the release is planned for later this year. This news has just been confirmed by a Universal executive to us. More details and better scans asap.
. I have put some non-sting items for sell on ebay : REM, Bjork, Radiohead... check if something may interest you!
. I have update Mercury falling, Ten summoner's tales, Soul cages & All this time lists. See disco page for more info.
. I have separate articles/rarest items/discography page. So, you can now read the articles and see the items I am talking about HERE - see the rarest items HERE - and have all the infos and updates on the discography section HERE. Simple!
. I have add 2 videos (Parkinson show and totp special concert) in the video section.
. I have updated the latest items section.
. I have update my CD collection list.
. For people who do not notice, I have also update the picture gallery. The Until promo CD which was for sell on ebay goes at $130! Ebay makes collectors going crazy! It seems the German ...all this time was also reissued with gold sleeve... German collectors can confirm this? Check the message board and help hanugn about "movie "Prelude", directed by fbrizio Ferri, Sting plays Bach Cello Suite no.1 prelude" ... I am curious to know more about this strange image! - I have update the Fragile & All this time list with more understandable rarity notice... check these. Hope everybody have a great christmas time... I have put my christmas present to all of you : I have change the picture gallery and update it with new pictures, especially 12 pictures from "All this time"... check it and download! - I have update all this time list and info with scan of : French CDr, Argentina magazine, China issue and japanese promo MC. - I have update the Fragile list with info and scan of : German CDr & German remix promo CD STCDP2. - I have put scan and info of the latest items I received :Taiwan issue of Mercury falling & Demolition man, Japanese promo CD of My funny friend and me, South Africa special issue of Ten summoner's tales. Also add scan of another Chinese bootleg CD of Ten summoner's tales. A special thanks to Greg Bratton to the scan and info... and to Tom Rose to send me the remix of Fragile which is soooooooo bad! It is comparable to the Siter moon mixes of 1996 if you see what I mean... nothing to do with the song! I have updated my CD collection list... I "stole" the idea of Tom from www.northnorthwest.de of the point for the updates... it is so good! OK, I have resolve all my problem, and everything is back to normal. I have a lot of other things to do, and so on, the site is not updated as often as I want, and also, as you want. No issue is previous to december, only some updates... sorry. The ...All this time list : just update the list... 30 CD are now listed! The Fragile list : just update the list... 15 CDs are now listed! I have update my Sell list, with a lot of ...all this time items for sell... check it. Produced by DJ MONK of RABBIT IN THE MOON!!! Also, there is a promo German CD of this remix, catalogue number STCDP2, more info as soon as possible. - German 1 track promo CDr edited by Motor music, with info sheet. It has infected 2 System files and send an infected email to all the people from my mail box. A very bad thing! I have to format & reinstall all my system, so on, I am really sorry if I could not answer to any email during a moment... thanks for understanding. Sorry for the lack of update latly... I have to update the All this time & Fragile lists, please leave me some more day... but Tom Rose has find an ATT Australian release (yellow sleeve 17 tracks), and I am waitting for the South African one. Today, I go to my usual record shop, wherre the Tuscany concert was diffused on a big screen... exellent! In Barcelona, I miss Antoni, Carbo, again! But I found the All this time spanish promo sampler ($40), the spanish & french promo single of Fragile... but nothing more! Scan of the spanish sampler is here. Martin Vauchel is here with me and we have pass the 2 last days on computer to reinstall everything... and this afternoon, we werre in Montpellier, and we met MANU KATCHE! Yes, he was just there with his family! We werre so suprised! We do not want to bother him, he seemed to be far away from star system! Tomorrow, I go in Barcelona to a big record fair... hope to meet Antoni Carbo there. I will take 3 days off computer, so I will be back on thursday, I hope with nice items from Barcelona record fair! Until then, check www.northnorthwest.de for update on all this time releases! Check info on the Fragile US CD (probably a promo)! Visual works : the Sting videos : new section presenting the Sting TV broadcast I have on CDv... and the sleeves I done for them. There is Spanish promo 6 tracks sampler with yellow sleeve. Tracks are : FRAGILE / EVERY BREATH YOU TAKE / ROXANNE / ALL THIS TIME / IF I EVER LOSE MY FAITH IN YOU / MOON OVER BOURBON STREET ... more info ASAP. It seems there will be different colours for the different issues of the All this time album... Check the all this time site for details. 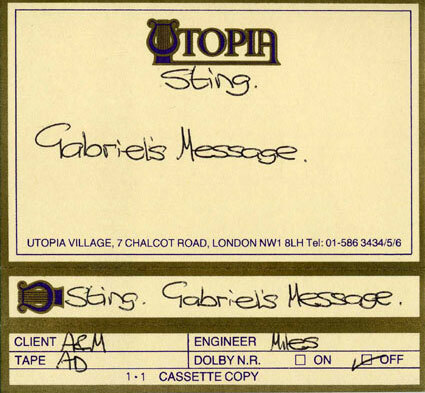 Tom Rose tells me that the catalogue # of the german release will be: 493 156-2 (info: motor-music), it has a yellow "S" in Sting and yellow dots. huh! Also, Kenneth Nielsen just got the EU promo and tells me: is comes in carboard, catalog nr. STADV1 Inner center of disc says, made in the uk. Ups, disc is green with white text. The front sleeve has a yellow S insted of the red one. As I wait for the UK promo, will be if it is the same before putting it in the All this time list. It is now official, there will be NO release of Fragile in the UK!!! Patrik Nevyn send me scan and info on the European promo CDr of the All this time album: I'm not sure it was made in Sweden but I got it from the swedish branch of Universal Records. This version has the same errors as the german one (1000 years, IYL SOMEONE), and it also says "Med About You", I guess this could be the case with the German version too. It has an A&M logo instead of the Universal logo and "World Track Listing Album" is printed beneath "...all this time". See scan in the all this time album list. Also, Christophe Laversanne send me scan of the French promo flyer, a so beautfiull item as always... see scan here. Thanks for all the people who send me info and scan of the new items, ecspecially Tom and Christophe... it takes me 3 hours to set up these lists and scans, it would have take me a day without help! I have received a copy of the 16 tracks CD... and heard The hounds of winter, Mad about you & Moon over bourbon street... and it is crazy how good it is!!! The hounds is my favourit, definitly! Also, I received my a copy of the all this time show... it sounds that like the concert any fan know Sting can do, but he can't as most people who come to his concerts want to hear song as they know it (hope what I try to say is understandable). A thousand years / perfect love : I was one of the first people who discovers this version in Montreux in Jully, and they have improve it. I could never ever hear the album version of Perfect love without thinking it is a mistake hearing what it becomes. All this time : so unusual... hard to go in it as it is baffling... but good! When we dance : the cello part in the middle... directly into heart ! Favourit! Dienda : superb, great that everybody can know this superbe song know it is on an official release. Shape of my heart : one of my favourit song, so, exellent, but too short! Every breath you take : boring! The Fragile 3 tracks promo is at $80 at 3h from the end... and the soul cages single digipack issue is at $150 on German ebay at 2 days from the end!!! Hey, collectors, are you crazy!!! Nobody would want to sell a Fragile promo at a reasonable price after that ! The Fragile Spanish promo CD is on sell on ebay... check a picture in the latest items section. "here´s a digishot from the all this time promo. it´s true: the cover is plain white, nothing on it. the cd itself was made by someone obviously not a sting fan: it says 1000 years instead of a thousand years, if you love someone instead of if you love somebody. it seems there´s no catalogue # on the disc - and no a&m logo! as you can see, there´s a motor.de (the german distributor) and a universal logo on it - plus the tracklist. around the hole in the middle it says: manufactured by record partner gmbh - telephone, fax and email. there´s 2 numbers on the disc - which i guess don´t necessarily mean they are the catalogue #: a big on on the transparent side saying DC07037041241 1 80B1. another one on the back says AMCR80SG351 A090010181. who knows. " "the sound is great, though. as you can hear, my enthusiasm is limited - i think through most of the songs you hear a sadness that isn´t supposed to be there. it definitely sounds like the songs were intended to be light and joyous - but it´s different - and you can hear it. my definite favourites from first listening are dienda (song by kenny kirkland sting says) - sounds a little like "my one and only love", the hounds of winter is fantastic as is "don´t stand so close to me" if it wasn´t some strange medley (this time with when we dance) - again. roxanne is arranged great, too. brand new day is arranged very surprisingly - but veeeeeery smooth :-D - if i ever lose my faith - great stuff. after all: cool. but it´s so damn sad that you hear what happened that day all though the album. or only i do. i don´t know." I just here a part of the songs on phone with Martin (he has a good web connection, not me), and for me, it seems exellent, but I will tell you more when I have the recording. Tom rose send me scan of the Fragile UK promo CD he received, and it is slightly different to the first one I show you here. It seems it is Tom Rose who will find all the new promo... he got the first All this time album promo: "someone offered me an all this time promo today. he told me on the phone it comes in a neutral, unprinted white cardboard. it´s still sealed so he couldn´t tell me what´s written on the disc. i expect the item next monday or tuesday. more when i have it." Sean I.M Potter tell me the UK promo CD, probabaly the blue one, as the catalogue number FRAGIL1. I think A&M will make us going crazy... And it is only the start! i´ve received my fragile promo cd today. it´s slightly different from the one you show on your site. the disc has the catalogue-number STCDP1. 2 tracks: fragile (radio edit 3:44) and fragile (album version) 4:10. the songs are definitely from the same night (stings guitar is slightly out of tune on both versions) but are mixed / mastered slightly differently. dominics guitar is definitely a little more on the left on the radio edit. and mid-frequencies are a little fed up (which is kind of normal for radio edits). 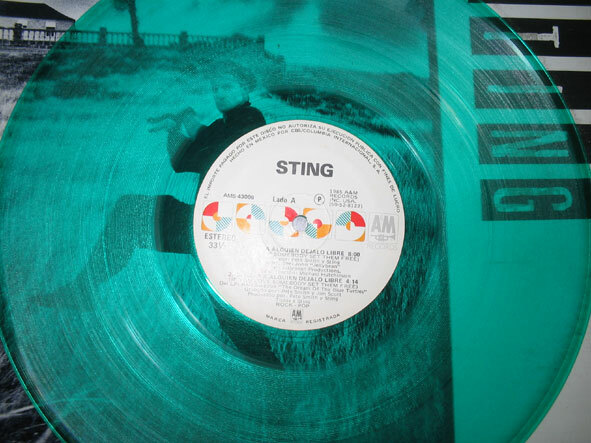 the disc itself is completely white with "sting" in silver (cut through the painting = not painted) and "fragile" in light blue like on the cover which is the same as yours. Check all the new about US tour and UK TV promotion on sting.com. The October issue is ready, with an article about the 10 rarest Sting promo CD. Check the disco section for pictures and info. Ialso add some scan to the rarest album section. The fragile page is ready, and will be update each time the info come to me. If you find a Fragile or All this time, please write to me! "The campaign will start with a Parkinson special on November 3rd (interview & performance of 5 songs). On November 4th there will be a national covermount with the Mail On Sunday (the lead track will be "Fragile" & there will be CDROM elements with Sting talking about the album) . The campaign will continue with a Radio 2 in Concert Special that will transmit on either the 10th or 17th November. We are awaiting confirmation of CD:UK (10th November) & Breakfast with Frost (11th November) The Concert itself will be broadcast on either C4 or BBC in the run up to Xmas. Thanks to Stingus for this info. But it is strange that the first CD is the same as second one, but with 2 tracks instead of 4! I do not understand. It is a 2 tracks & a 4 tracks single, and not a 2 CDs set?? The October issue will be on line next monday with the september article about rarest CD promo album. Check this site often! Here it comes, the first promo of Fragile single, and the new sleeve, which I LOVE! Thanks a lot to Kenneth Nielsen for this scan. This CD is , I suppose, the UK promo CD with single edit and album version of the tracks. I simply love the sleeve, something that did not happen for a while! So impatient to listen tot he album. A new "all this time" page is up which will be updated each time there is new info on the album. Check it often! Sting us & sting.com bring us this info too : Furthermore, the recordings from the show on the 11th will be used together with recordings from the 10th of September, that was the show in front of Universal executives, etc. As a 5-camera film crew captured the process of Sting preparing this acoustic gig, this footage will appear on a full-length DVD companion to the album scheduled for release in early December. A single, "Fragile", will be released to coincide with the album’s release. Sting ... "All This Time", will be in stores on November 5th (International) and November 20th (USA/Canada). The A&E network will be airing a documentary on Sting's All This Time concert with all the behind the scenes action including reaction to the tragic events of September 11. There was a second concert done the night before the publicized one allowing A&E even more access. Look for the documentary to coincide with the release of All This Time. The documentary's airdate is tenatively scheduled for November (thanks Andrea!). WARNING : I have been infected by a bad VIRUS, that I maybe have send you on latest emails send on sunday 23.09. If you have received an email from me at this date, please remove it and check your hard drive with an anti-virus. If you did'nt not have one, just ask me and I will tell you what to do! Check this page to help us peoples. My interview with Sting : read all the details on this amazing meeting. My sleeves : the sleeves I have design for my Sting items. Links : update the links to Sting page. 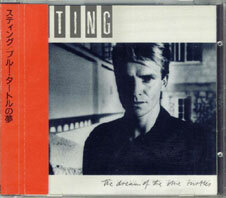 Special features : article about the rare Sting tracks not included in my collection. Sting has performed Fragile at the Amercia : a tribute to heroes broadcast. Fragile would be the single issued from All this time album. The Police Gatshead 82 live performance will be reissued on DVD and VHS in Japan. Sean Potter has find a Desert rose CD single released in... Australia! It states it on the disc, so it finnaly exists. It is the same as German. On friday morning, me and my wife werre going to Toulouse. 20 minutes before we arrive, a chemical industrial structure has explosed and killed 20 peoples, and hurst 300. World is crazy this time. We are safe but a little shock. So, we spend 2 days inside the apartment, I am fed up with the world! Seeing what happen in USA on 11.09, and as our plane was previous on 12.09, my wife and I prefered cancel our trip as we won't know what could happen after this tragedy. There is no words to explain that, and all my thought are going to peoples who lost someone in this tragedy. As you know, the acoustic Sting concert was previous the same day... the album won't finaly be called "On such a night", seeing what happen, but "All this time". The cover picture here would probably change. Jeremy make a review of it that you can read on www.stingUs.net. A lot of songs werre canceled, but the final set list was : Fragile / 1000 years-Perfect love gone wrong / All this time / Seven days / Hounds of winter / Don't stand so close to me / When we dance / Dienda / Roxanne / Set them free / Brand new day / Fileds of gold / Shape of my heart / If I ever lose / Every breath you take / Message in a bottle. All songs werre played in special version, but read Jeremy review for details. Thanks to Karel for the scan of the cover. The album will be released on November 5th internationnaly, and on the 20th in USA & Canada. I will take another week off, Iam just here for today, I won't answer to email until 24.09 as previous. The September issue is now online: the Jully & August articles are ready! Yes, I know it is late, but it is better now than never! Jully article is about Japanese 7" & 12", and August article is the 10 rarest 7"! The profile new section is now online, check it to know how it works and read my profile! I won't be at home from 09.09 to 24.09, as me and my wife are going to Vietnam for our honeymoon! Also, I could NOT give you informations about the "On such a night" live album that will be recording next week. If you want to have info about that, check my freind's Martin site at www.milliondoors.fr.st, or www.stingus.com (if it works as last time I viist it, there was troubles), or even www.sting.com. I will give you all the details when I come back! Also, do not worry if I do not answer to your emails! I think US A&M compagny is going crazy! Rainer Hake has found 2 new promo US CD of After the rain has fallen! One is a promo CDr test pressing of the radio remix. The other one is a new 2 track promo blue disc, with a different catalogue number AMRR-10288-2, Album version & video edit instead of Video edit/Tin tin out, and a back inlay! If you are a little bit lost, check the After the rain list that has been updated, or the latest items section for scans... Thanks to Rainer for his help. 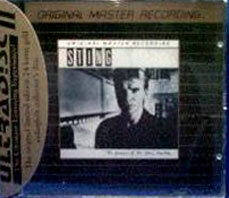 OK, and for people who have asked me this question, I have count how much Sting CDs I have, and... 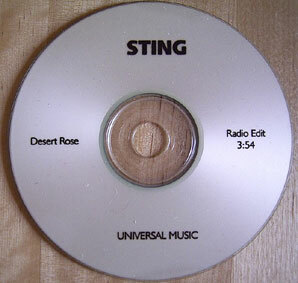 I have 451 official Sting CDs (album + singles, not the bootlegs or non A&M records). I am back from this amazing concert in Montreux Jazz Festival. My friend Martin makes an exellent revue of it, read it. I am really sorry with the lack of update this month... I was working on a personal graphic web site which present my photography et graphic work. You can check it at www.imaginaires.fr.st. If you like it leave me a message in the guestbook. I am really happy as I have, at least found 2 tickets for the Sting Montreux concert on saturday, and at a good price... It is not sure that Frederique, my wife, can come, but I cross my fingers. Now we know the Sting acoustic concert will be in his home town in Italy, how much could cost a ticket on ebay if there is one for sell? Concerning out of print, I am thinking of change this home page, as a lot of people are lost in it with the left to right navigation... So, the next update will probably be the version 4.0 of the web site. My friend Martin close the hounds of winter web site and open A millon doors to eternity... check it! I am really sorry to know that Stingchronicity is closed, but I totally understand the position of Dave and Wendy. We do these sites as we are fan and want to share our passion with other fans. All that we want is that make people happy... it is not a job, we are not pay for it, we even take on our fammily time to do this passion... so on I totally understand how bad it could be to receive negative feedback. Dave and Wendy, I totally support you and I hope you change your mind. Sting LAST EXIT Wispering voices first 7"
I have add scans of the Nothing like the sun US DTS CD which comes in a special package, and the rare Desert rose Canadian promo CDs. I have received another Funny Friend promo CD! In fact I buy a second US "for your consideration" Disney promo CD for a friend, and when I received it, a surprise, it is a CDr! But a professional CDr with the same writing printed on the disc, and a mastering studio back sleeve! The disc is in fact white with black writing instead of silver! A weekly Sting-newsletter has been started up for the anglosaxon community to which www.stingus.com will contribute weekly. It will bring lots of info on your favourite artist. To join this announcement only group, send a mail to Sting-Newsletter-subscribe@yahoogroups.com. Joe ' giacomo - a dream of reign web site has been updated. The June issue is ready... and I have made some changes on the site. There is now a new section, that you can find on the right of this texte file, called simply "the discography" which contains the monthly articles, and scans of the rarest Sting items. 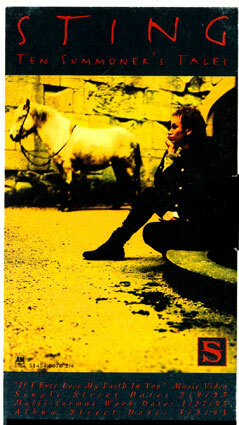 So, the june article is the list of the 20 rarest Sting CD singles! It takes me hours to make it and to scan all this items, and I hope you will be happy to see items you do not know that exists! Sorry, no picture this month, too much to do with the article! Check the monthly issue for all the details. Also, I have made a new splash screen... and so on, made a wallpaper... download it here! There is a Spanish promo CD sampler of Ally Mac Beal soundtrack which features Every breath you take duet as first track. Also, the new album of Cheb Mami features a track called "Le Rai c'est chich" which seems to features Sting on backing vocals. There is a promo CD of this track. The June issue will be online next sunday. The final list of the 20 rarest and most interesting CD singles will be ready soon. I hope I would have time to put the Best of pages too. I have received the Mercury Falling Virgin box set and it is one of the most amazing and beautifull item from my collection. It was in fact issue in Japan and not in UK as I think. Check picture and details here. Strangley, Mercury has the same catalogue number that European issue. I also have a chinese issue of Ten summoner's tales which is different to the other one, and which is probably a bootleg as it is so bad designed. Check details and scan.The DTS reissue of Nothing like the sun comes in a special package, scan willl come soon. There is a Emperor New's groove promo Sampler from Taiwan. The CD comes in cardboard envelope, released by Disney. It contains My funny Friend And Me - Sting 2. My Funny Friend and Me-Sting (spanish version) 3. Perfect World-Tom Jones 4.Chinese track. Catalogue number is AVDCD700069. 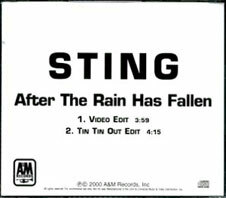 I do not consider it as a Sting single as it contains tracks by other artists, but I think it was interesting to talk about it. http://sting.alfbank.ru is an amazing russian web site, so well designed! Even if all is written in russian and that I do not understand 1 word, it has a very nice picture gallery, and a discography that list a 1991 strange fan box set!! And if you click on the little Sting picture on the home page, you can download a nice screensaver... I love this site! I have add scan of the amazing and so rare Mercury falling promotional french sampler. 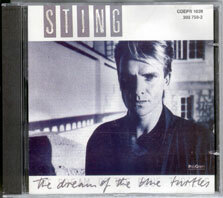 June article will be the list, details and pictures of the 15 rarest Sting CD singles! 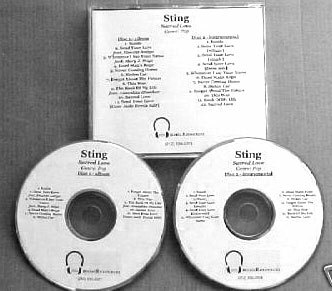 The Sting sell list has been updated... take a look for some new CDs for sell. Someone need your help at the message board, please help her. The Ten summoner's tales MC et LP list is ready. To sum up, the following lists are ready. What will be next? Submit me your point of view. I have received the Australian My Funny friend and me promo CD. the sleeve is the second one, as Taiwan issue, and the back sleeve is the same as the sleeve, not the one of the German CD. Sell lists have been updated. The Ten summoner's tales CD list is ready. Check it and tell me if I forget something. LP & MC issues will follow. I have put scan of a Chinese / Taiwan compilation called "thousand years". It is probably a bootleg. Also, Kenneth Nielsen send me scan of the After the rain has fallen 2 tracks promo US CD he has find. It is the same as the one listed in the After the rain list (AMRR-10181-2n, blue disc, with Video edit & tin tin out edit), the first promo US CD issued before the remix version, but his copy comes with blue and white back inlay... I am looking for this one. See it. It seems after the rain won't be issued in the US as a single, even if the video was shoot. I do NOT understand. Stingchronicity annonce the live album! The May issue is ready earlier than I said, but without the Ten summoner's tales list, sorry! - 25 new pictures in the gallery, with 14 ones of The Police! Check the monthly page to know which updates have been made in April. I have an extra copy of the Fender CD Rom for sell. I have put it on ebay. Good luck. The May issue will be online on monday 07th, with an article on the japanese phone cards, new pictures in the gallery... and maybe, if I have time, ten summoner's tales page! I have received the Fender CD rom, and it is a very nice item. It comes in CD single jewel case, but the inlay is square. The video is a report about compaq computer used during the brand new day tour, with Sting talking of it. It is more a long compaq commercial than a real report about the tour, but it is interesting. It runs around 4 minutes. There is alos texte and picture... Kipper with his compaq computer, Sting with his compaq computer, Kim turner with his compaq computer ... :) Thanks a lot to Rodolfo to his help to find this item. I have update the Mercury falling list and put details and pictures on the rarest issues. Stinchronicity have change... it has now only one frame, really more usfull... so much things to read! I love the gigography! So usfull. I have update the My funny friend and me list and put details and pictures on the rarest issues. I have done the same for The Soul cages. I have update the brand new day list with details and pictures of the 2CD issues (Taiwan, Singapor, Malaysia, Korea...). There is now 45 different issues listed! Thanks to Greg for help & scans. Also, I have update the bnd singles lists. One of the extra bonus tracks on the new acoustic live cd is probably "Where Will You Be for Christmas" that Sting sang with Yolanda Adams (originally released in December 2000 in Japan on a Unicef charity album Music Of Love). This is not confirmed though. *Single #1 either new song or new arrangement of "Fragile"
Thanks Karel to share these infos. Sting has shoot a new video for After the rain... so the song would probabaly be released in the USA as I have think... more details on stinchronicity. I have updated my audio list... it is the listen section. The last section of the "summoner's collector" part of this site is finished : the history of my metting with Sting and my interview of him. If you want to know why Sting record "Oo la la hugh"... read it! I have put scan of the rare fender CD-rom. At least, all the items I have for sell are listed in the collector corner. As you will see, there is items I have for sell, and from my friend collection I have talk about. But you can order all these items directly to me. The April monthly issue is on line, but without the pictures and the article, as I won't have the time to do it this month. But, I have put the list of all the releases of My funny friend and me known so far. The acoustic live album is now confirmed and it is probably the greatest news I have heard. I am really happy Sting goes back to what it do the best, acoustic live!! As seen on Stingchronicity: people who purchase the Fender Sting Precision Bass receive a copy of this Compaq/Fender CD-ROM which goes behind the scenes on the Brand New Day tour and is said to include footage from one of Sting's shows last year in Hawaii. Take a look on Wendy & Dave web site in the news page, for a picture. Concerning My funny friend and me, there is a promotional German CD which includes english & spanish versions in jewel case, for which I will give details as soon as I get it & it seems there is also an australian promo CD. See the complete list. I have work on an other web site, of the band lunatic age (nothing to do with Sting). Take a look. There will be a live album from Sting ready for commercial release in the Christmas period! Unlike any other past CD, it is the plan is to record a concert at an intimate venue in Italy in front of a 300 capacity audience made up of fans, contest winners and record company staff. The set will include acoustic guitars, piano, organ, etc. with potential appearances by special guests (yet to be confirmed) such as Cheb Mami and Branford Marsalis. The tentative release date for the live album will be November 5th. The first single has a planned radio date of September 17th followed by a commercial release date of October 15th. The video for the first single is scheduled to be ready on September 16th. As soon as we have confirmation of the title for the live album or first single a circular will be sent out to let you all know. As you see in the details under this article the tracklisting for this live album looks very strong and includes hits by the Police as well as Sting. A brand new track composed by Sting for this record is planned to be a down-tempo ballad for Christmas. Furthermore, a special A&M TV show about this will be made + lots of extras, so stay tuned for a very nice treat! Do not know if it is true but seems amazing! About the Emperor new's groove album. 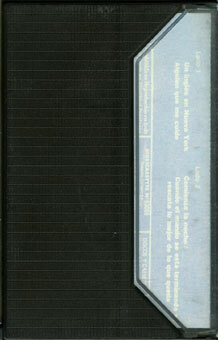 The French album soundtrack, contains, added of the usual track listing, the Spanish and Iitalian versions of "My funny friend and me", and a video. Also, as seen on Stingchronicity, the Taiwanese CD is a 15 track CD from Taiwan. which features the Spanish version of My Funny Friend And Me, the video for the track, a 'making' of the video feature video and a bonus CD which includes a Chinese version of My Funny Friend And Me (sung by Chyi Chin) and an instrumental version of the track. The portuguese version of Perfect love gone wrong exists. It was release on the brazilan reissue of Brand new day album. Here come the details send by Darren Gray.
" I thought you'd like to hear some news about the Brazilian re-issue of the BND album. It was re-issued this year (to coincide with Rock In Rio? ), although the sleeve would have you believe it was issued in 1999. The CD has the Portuguese version of Perfect Love (listed on the sleeve as "Duet with Zelia Duncan") and has a bonus track Desert Rose (Melodic Club Mix Radio Edit). The 'old' version of Perfect Love doesn't appear at all and track 7 is Prelude to End of the Game. There is no EPK on the CD. Cat no is 60694906852. The booklet has the Portuguese lyrics instead of French for Perfect Love. " I found the Fragile remix, 160 kbps 44kHz. Running time 6:30. I think it's great, and its very well. In fact it's really reworked, added drums piano and more. Well I been in contact with Ben Liebrand and he says that he did all three mixes. Englishman In NY - Fragile - and Mad About You. I asked him why the 2 other tracks newer was release by Sting, He tells me that he thought that they were !. We know they ain't. He consider releasing the on his on label, but have to get some proper licences. About: Mad About You, he writes: "It was an official remix mad from the original multitracks, and was approved for release by sting. Watch for the bass slide which appears 2 or 3 times in this mix. Listen to the mix over your speakers (not over your headphone) It should appear way outside the normal stereo field in your left ear. Thanks, Kenneth, for these amazing info! At least, I have put the collector corner... but it is only the first step. I have put a lot of rare items on ebay for sell. Check the collector corner page for the list, or go directly at my ebay seller list. Stingoo!! :a very good & usfull job made by Attis. After the rain has fallen could be released in the USA!! Why I said that? Because, I have found 2 new USA promo CD of the track, with a total new remix version. Also, there for sell on ebay an add for the track which states "The follow-up to the smash Desert Rose". Whatever, nothing is sure. The promo CD comes with a grey & black back inlay, the promo CDr comes without catalogue number anda black & white back inlay. (Thanks to Greg for the scan). Also, I have received the Turkish promo blue jean CD-rom. It is a nice item, even if the disc interface is badly designed. A funny thing as that some of the pictures from the gallery are directly taken from my old web 10 site as they still have the border I have put! The most interesting thing as that it contents videos of All this time / Brand new day / Englishman in New York / Fragile / If I ever lose / shapoe of my heart / Fields of gold / and the very rare coulour video of Mad about you. The German My funny friend 3 tracks CD with Italian version of the song have been issued. 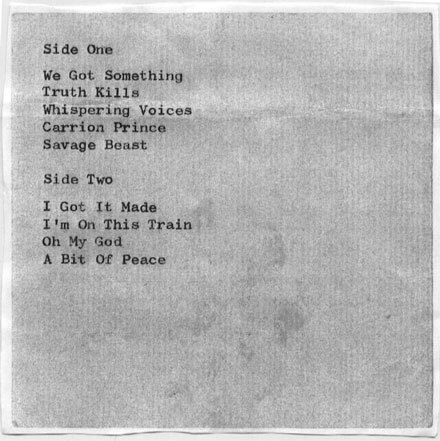 Back sleeve is the same as the 2 tracks CD. I have add the Bring on the night & Nada como el sol scans to the long boxes article. Also, I have add scans of the very rare french BND promo CDr with Fnac sleeve. The LP & MC albums lists are at the end of album pages, after the CD releases! A new After the rain US promo have been found, more info when I can. There is a promotional various artists video on sell on ebay with the promo video of "My funny friend and me". Anybody see it? I have add the lists of MC & LP releases of Soul cages & Mercury falling. Why I am not in bed at this hour? Because I want to bid on the Brazilian Funny friend CDs on ebay but finnaly lost the auction against Sean! Whatever, to wait for the end of the auction, I have made the Mercury falling list. Take a look! The March monthly issue is finnaly ready. Picture gallery : 16 new pictures from Cream, Arena & Rolling stone magazines. I have received around 100 Sting and Police records from a friend who is selling his collection. I have to list everything... check the site for a list or write me if you want it directly send by email. The collector corner is still not ready yet as it is a huge work. I have received the Chinese issue of Ten summoner's tales which comes a special design. Not sure it is an official A&M record, but it is a nice issue. Only for people who visit the site often, a new index... On sunday, 16 new very nice pictures will be added to the gallery... and, if I have the time, an article about the rare and so nice US long box issues of album, with pictures, of course. Write me if you want to be added to the mailling list, you will receive an email when it is ready. I have change this home page... you can now directly see the archive or latest items added by clicking on the buttons over this text field. Also, the message board is accessibble directly from this page, as the collector corner, even if this page is not ready yet. The "problem" page is not ready, it will be a copy of the news in an html page, as Nestcape users can not read all these info. The march issue will be ready on 11.03.01, as I am preparing a photographies exposition (nothing to do with Sting!) which gives me a lot of work to do. I have, at least, received the Murlyn remix promo CD of Brand new day, and it is an UK promo CD and not German as I was thinking. The country of pressing is writting in the center of the playing side, scared in the disc. A rainy sunday... so I have work a lot on the site! But you won't see it right now, I have some things to fix. The new version of my friend Martin web site is up, you HAVE to visit The hounds of winter. A recent issue of the Turkish magazine Blue jeans comes with a very nice promotional Sting CD-rom which contains video clips, lyrics, discography (what??? ), audio mix and photo gallery. I have no other details on it, and I am definitely looking for one copy. It also contains Eminem's video. It is issued by universal records. More info. I hade add to the Brand new day singles list, infos on the vinyl & MC releases. Also, could someone give more information on the Desert rose US promo 12" (sleeve; label) & on the After the rain Italian 12" (lalbel colours, track listing)? Please write me. The "My funny friend and me" second promo CD, which comes in a white sleeve with black writting, is a CD and not a CD-r as I have think. It is, in fact, issued by Disney record company, and the catalogue number is WDR 03MS365000. There is a lso a promotional DVD of the movie, issued by Disney. It comes in black DVD case with a little picture in the middle. The movie will be released in France on March the 28th... and the French title will be "Kuzco, l'empereur Megalo" (which means 'Kuzco, the megalomaniac emperor'... nothing to do with the original title!!!). Whatever, I hope the song will be recorded in French too. It seems it has been recorded in Italian... more info on Stingchronicity. Here it comes... the brand new day list is ready! OK, there is only the list, but it has been updated and re-made, ordered and detailled by country. Also, I have added a colum to state if I have, want, or do not have (which means do not really want) the issue. The info section will link to details on the item, but not for tonight! If you have an issue that I forget, please write me! also if you see a mistake! People seems confused about Brand new day 2 CD set... it was issued in Taiwan& in Holland, not in Australia as I have think first... more info when I can. My aim tonight, was to redesign & update the brand new day lists... but the old softwear I use to do version of 2 of the site is not compatible with the one I use by now... and I have to rewrite all the list! I am so happy, I can't stop crying! So, for tonight, you can only read all news from December 00 to August... choose 1100 - 1000 - 0900 - 0800... interesting isn't it! I have also change some colours... why I tell you that, nobody have notice! Download : you will soon can download wall papers or other things... not ready yet! Listen : my sting audio list... more update to do, but it is almost complete. Brand new day have been reissued in Taiwan with a second disc as bonus. The tracks are the same as on the "Australian" CD (not sure yet, haven't found this one) : “Windmills of your mind”, “A thousand years”, “Desert rose” & “After the rain” live, and “Desert rose - melodic club mix radio edit”. Antoni Carbo have found a promotional cassette of the brand new day remix album. Of course, it is japanese, and come with a purple sleeve with japanese writtings. It contains only 6 tracks : Brand new day (murlyn mix) / Desert rose (melodic club mix) / After the rain (tin tin out radio mix) - A thousand years (Times is that which ends mix) / Brand new day (Cornelius mix) / Perfect love... gone wrong (featuring Lisa from M-flo). I do not know yet if the thousand year remix is the same... It is writting, on the inlay, that the other tracksd from the album will be Desert rose (filet dub mix) / After the rain (Tin tin out club mix) & Perfect love (Brazilian mix with portuguese rap) !!!! Do not know if it finaly exist! This song was finally released as single in Taiwan. It seems it is a limited edition, and, added of the edit and album version, it contains the Spanish version which, for the moment is not available anywhere else. The sleeve is very nice and the catalogue number is 70069. My funny friend second US promo CD It seems there is another promo CD of the song, which comes in black and white sleeve. It contains only one version of the song, and is probably a CDr. More news when I can. Brand new day 2 CD set reissue. The brand new day album have been reissued as a 2 CD set. The second disc contains “A thousand years”, “Desert rose” & “After the rain” live, “Windmills of your mind” and “Desert rose - melodic club mix radio edit”. I suppose it is an Australian issue, but I am not sure yet. Another single of “After the rain“ has been issued! And this is a suprise as it is a French issue! Someone has ask me to buy a copy of the French single, and I go to my usual shop to do it, but was a surprise when I see that the single is not the same... it includes “After the rain - tin tin out edit” as second track instead of Desert rose! So, the first issue, was really a “Limited edition”. The catalogue number of this one is 497 323-2, usual cardboard sleeve. the sleeve is clearer than the other issue... I have 2 copies for sell, write to me at outofprint@wanadoo.fr. Also, I have received an extra copy of the very rare French 6 tracks sampler. I have put it for sell on ebay. Sean Potter write me that : Today, I picked up a promo "Polydor New release vol 6 November/December" - tracks 12 is entitled "A thousand years" which would indicate an imminent UK release! 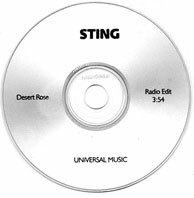 Sean Potter has received a promotional European CDr of Desert rose... it is a white disc with Sting at the top, “Desert rose” on right, “radio edit 3:54” on left and “Universal music” on down... he baught it to a Swiss guy but no other info from country of pressing are known! some other news... French DVD & VHS So, the Brand new day tour DVD was well released in France, but it is the same as the European release, with the 15 extra footage and the sticker on front that states it includes the new single “Thousand years”. But, it also was released as a video... probabaly in secam system. I know that I tell that since a long time, but the site is not updated as often as I would want... so much to do... but I have to tell it again! Sean received it and gives me the following info : Jewel case with no front cover, but there is a back pure white with black writing with normal details. silver CD black writing "Sting Desert rose with remixes" - Cat no UMCR41342 - radio edit (3'54) / LP version (4'46) / Melodic club radio edit (4'44) / Extended remix (9'20)... lucky you! The promo CD of “My Funny Friend and Me” has been issued in USA by Disney. It contains 4:25 Radio Edit and a 4:36 Album Version. 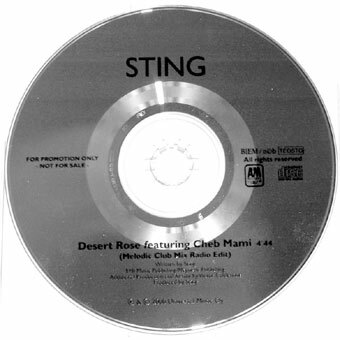 The USA promo CD of Desert rose with catalogue number INTR-10093-2 seems to be the same as the first one, but the tracks are not in the same order (LP version is the third track, Melodic Club mix radio edit the second one!!). I have found a new an unknown promotional French CD of the Brand new day album! It is a Sampler CDr, but this one contains 6 tracks instead of 5. 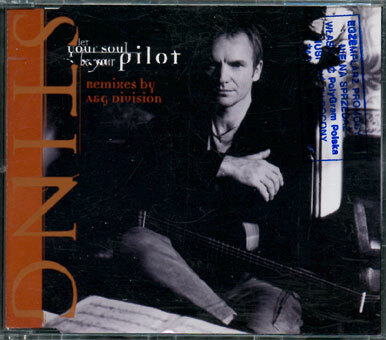 It comes without sleeve and with the same design as the French promo CDr but it is written “Sting - découvrez 6 titres de son nouvel album - sortie le 28 septembre” (discover 6 tracks from his new album - issued on 28 September). The tracks are written like that : 1. 1000 years / 2. desert rose / 3. Big lie - Small world / 4. after the rain / 5. Perfect love / 6. Brand new day. And, the best part, is that the versions are not exactly the same, the transition between each songs hasn’t been made. It can be particularly heard between Big lie & After the rain. There is also a complete promotional album CDr issued in France. It was issued for the Fnac stores. It comes with special sleeve, the same as the usual album which states “heard the new Sting album before everyone”.... or something like that. I have no other details and still looking for this one. I have seen a second promo CD of Desert rose from US. The only difference is the catalogue number which is INTR-10093-2 instead of INTR-10015-2... more details when I can. Freaks Issue # 53 is ready. In this Issue : Ghost in the machine demos... write Erwin at freaks@chello.nl to subscribe. 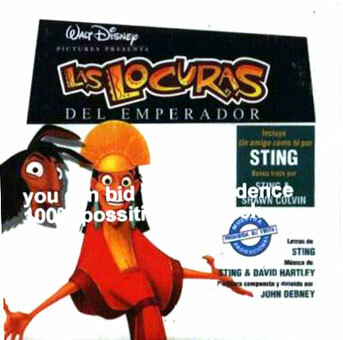 There is a promotional Euro CD of the song “Don’t walk away” by Youssou’n dour featuring Sting, in very nice sleeve. Site of the month : http://www.adreamofreign.cjb.net no need to speak, take a look and you will understand! Charlie Kriak have a stock of live at universal official promo CD for sell. The price would be $65 which include S&H. You can write him at howdykriak@aol.com or Charlie Kriak P.O. Box 33405 North Royalton, OH 44133-0405 USA No time for more update tonight. Still listening the remix of thousand years... I really like it. You take the intro and the end, and you put the original version in the middle, and it is the best version ever! Sorry for not having updated the site last week, but I was too busy. I have start a web designer formation, so don’t be surprise if there is changes in the site during the next months. Brand new day Cornelius mix : e very great version, with a great acoustic (kind of acoustic) intro. I really like this version. A thousand years - Bill laswelle mix: The first surprise is that this version runs 12’26. I have think it would be hard to remix this version, but the result is simply amazing. The intro is so good... the only bad part is in the middle, has it is a little “boum boum”, but the global is an exellent version of this track. Still working on BND list... I have found the BND remix album sleeve and it is... just have your opinion..
As the German CD, the South African “After the rain” includes the After the rain video and not desert rose as it is stated on the big sticker on front. The Brand new day DVD will well be the universal concert. the sleeve, is my graphic point of view, quietly bad, and easy... see it here. After the rain has been releases as a promotional CD in USA. The disc is blue with silver writtings, there is no sleeve por back sleeve, just in jewel case. It contains the video edit and the tin tin out edit and the catalogue number is #amrr-10181-2. Freaks Issue # 52 is ready. In this Issue : Brand New Day DVD release bootlegged / Whats going on in Russia part 1014 / Different Gear / New UK album CDR promo's / 2 new Andy Summers items... write him at freaks@chello.nl to subsrcibe. 2- The release date of the Japanese remix album of BND tracks is now been 13 September. The catalogue number will be (POCM 1300) and the full track listing is : Brand New Day (Murlyn Mix) / Desert Rose (Melodic Club Mix) / Desert Rose (Filter Dub Mix) / After The Rain Has Fallen (Tin Tin Out Radio Mix) / After The Rain Has Fallen (Tin Tin Out Club Mix) / A Thousand Years (Remixed by Bill Laswell) / Brand New Day (Cornelius Mix) / Perfect Love Gone Wrong (Brazilian Mix with Portuguese Rap) / Perfect Love Gone Wrong (feat. Lisa from m-flo). 3- Germany has issued 2 new single for After the rain!!! After The Rain Has Fallen (Video Edit) / (Tin Tin Out Mix) / Seven Days (Live) / Desert Rose (Radio Edit) / Desert Rose (Video) EU, 497 370-2, same sleeve as UK CD1, black disc with white/orange titles, jewel case. 4- out of print updates: I have put the After the rain has fallen complete list... also, as a lot of people have asked me, I have put back the list and details on BND album, desert rose and BND single, but they are not finished in design... but it is better to see an unfinished designed version that no list at all. So you can have access to the following page (not updated): Brand new day CD list Brand new day CD details Brand new day CD single details (and list with definitive design) Desert rose CD singles list & details The After the rain details list will come soon... I hope! I won’t be at home until next monday (21.08) so do not worry if I do not anwser to emails. I would have wanted to put desert rose & after the rain lists before holidays... but I can’t... sorry! I have found Singapour, China & Malaysia releases of Brand new day album, all with special OBI... more details when I have received them. I have put the BND single list, with the new presentation... please take a look and tell me what you think about it, if you prefer it like this or like it was in the version 01. The details list haven’t been remade by now... but it takes me 4 hours only to made the bnd list!!!! Sorry, still not the time to update the page. 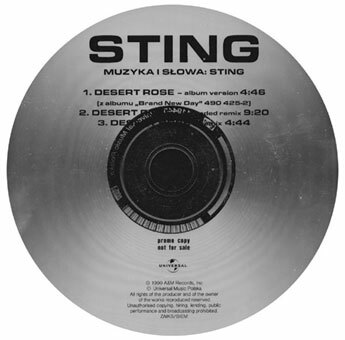 Seems that Desert rose was issued as a jukebox 7” in the US (info from shop : Desert Rose, US exclusive 2 track jukebox 7" single, complete with jukebox label strip). I have pass all my Sunday in front of this screen to redesign the bnd single page, and today when I want to publish it, the file has an error and I have to remade everything..... I love the computer ! So, no big update has previous... After the rain & Desert Rose have been issued in South Africa and have the same track list as German issues. Catalogue number is MAXCD 231 for After the rain, I do not know for Desert. I am waiting for them. I have had to this page the site of the month/site of the update links... take a look. Write me if you want to be the next one. Welcome to the second version of out of print. My aim by now is to make little updated each time I hear about a new item... For the moment, most of the site is not available I have to modife the pages. Only the brand new day & bnd news page are available. To have details on the latest items find for Brand new day take a look at the Brand new day news list. You will find details & pictures on : Japanese 3 track promo sampler in special sleeve Brand new day & Desert rose promotional brazil CDs Brand new day 1 track promo US CDr After the rain German 2 tracks CD After the rain Italian 12” with picture sleeve. 2000................................................... if you read this, I think you are crazy enoguh to have read all the out of print archive !